Husband, Farmer, Father of 4, Water Heater Master. The city-wide love for hot showers has grown tremendously over the last several years, due to my crew and I having done hundreds -- perhaps thousands -- of jobs for tankless and standard water heater repair and installation -- both gas and electric. Surely you'd prefer a super, steamy shower to an intolerable, icy one? Of course you would. Everyone does. Easy access to water on demand that's just the right temperature for bathing, laundry, cooking and cleaning is something we take for granted each and every day. And when that trusty home appliance goes out on you, don't wait to get it fixed or replaced. Hot water is a true luxury that many of us, today, would call a necessity. So, whether you're an individual homeowner, landlord, property management company, insurance agency, or general contractor-- be sure to call on us for any hot water related needs. Look-- let's cut to the chase. You've got a need for warm water and you want it handled by a local plumbing company you can trust, without it costing you an arm and a leg. ​We live for making people smile, and it just so happens that our area of expertise lies in fixing that one home appliance that gives you the most pleasure when you get up in the morning-- the water heater (did you think we were talking about the coffee maker?). ​Let us fix yours so you can heat up again like the inside of an Irishman's belly after three shots of whiskey. ​Or, if you're looking to buy and have a brand new system installed, we can do that too. Call us today at 912-244-8810. We've been in the business for a long time now, and our name gets thrown around quite a bit in the Savannah area. If you live in Pooler, Richmond Hill or on Tybee Island, we can help you there also, no problem. Generally, you'll find yourself in one of two situations regarding a leaky system -- It's either slowly dripping, or it's spraying out with some serious force and volume, flooding the surrounding area. If it's just a slow drip, there are two common places for this to occur: the temperature-pressure (TP) relief valve, or the drain valve. ​A faulty TP will need to be replaced immediately, as it serves an important role in preventing excessive accumulation of steam that could cause a tank to explode. If it's the drain valve with a slow leak, it could be a very simple fix. As easy as tightening up the valve fittings. If that doesn't work and it's determined to be defective, the valve will need to be replaced by a professional. 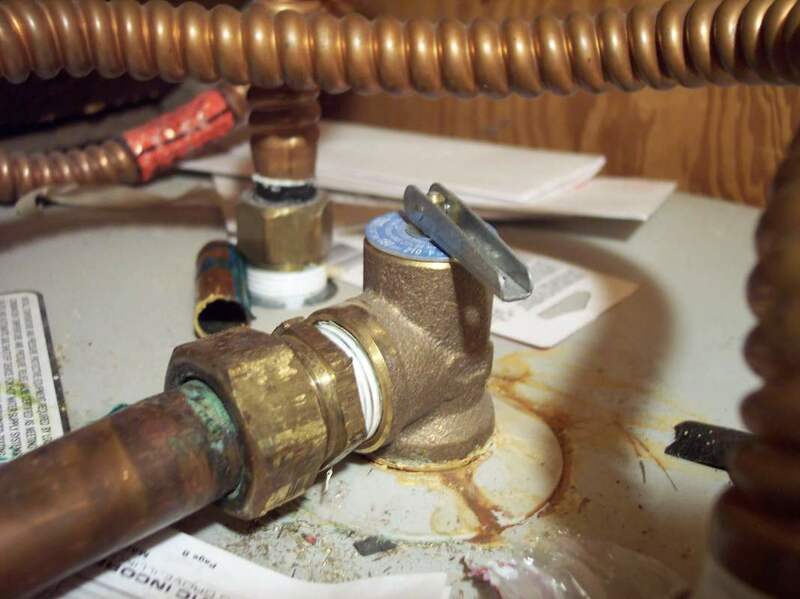 If you've got a bigger, more serious leak on your hands, make sure to shut off the supply valve immediately. With pressure and temperature rising and falling each and every day you use yours, it's only a matter of time before it decides to kick the bucket. They don't live forever, ya know. Supply pipe connections, heating element gaskets, corrosion through an old metal tank... there are several reasons your appliance might begin to spew high volumes of water at high pressures. Electric water heater repair is something we're seasoned pros at. But not to worry, we can help. Give us a shout and we'll give you a free diagnosis. Is There Such Thing As A Hot Water Heater? Many people call them "hot water heaters", but that's a bit weird isn't it? No point in heating water that is already hot. You can call 'em whatever you want. All we ask is that when you need a professional plumber to come out and do the best possible work for you, you call us first. ​We're Savannah's best when you need hot water NOW. What's The Price Of Repair vs. Replacement? There are several factors you should consider before determining whether you should have your unit repaired, or replaced with a new unit.​ Maybe you need gas water heater repair, or perhaps it's a new tankless unit you've got your eye on. As always-- we will only suggest what we believe to be the best option or you. So if you can't decide yourself, give us a call and we'd be happy to come out and take a look for you, and provide you with our expert advice, at no cost. Water heater replacement can be a great option. How old is the unit? Most conventional storage-tank units have a life span of 10-13 years. If yours is only a few years old, having it repaired is the way to go. However, if yours is nearing the end of it's rope, replacing it with a brand new unit is a wise choice, especially because the newer gas and electric ones are about 20% more efficient, which will save you up to $700 in energy costs over the life of the unit. Electric water heater installation is our specialty. Apart from those few things, the other issue you may have is that the tank itself is leaking due to corrosion. Water contains minerals and over time, as those elements chemically combine with the steel tank, corrosion and break down occurs until a leak eventually springs. If this is the case, replacing the tank itself is almost always the best option. Once a year, it's good practice to completely empty your tank and refill it to remove any sediment that has collected at the bottom. Doing this will increase the unit's efficiency (saving you money on energy costs), and help your unit to run better and decrease the chances of problems down the road. Check out these other tips for regular maintenance you can do yourself. Deciding whether to repair or replace your unit is a decision that requires a little bit of forward thinking. You may be able to spend a few hundred dollars now to repair it, but that will only last you so long, and eventually you'll need to replace the unit with a modern, more efficient one. Doing so will save you money in the long run with decreased utility bills. Replacing your old, conventional storage tank with a new, tankless water heater can be a great option if you're someone who sees the value in paying higher fees now, but saving money year after year and eventually recouping that initial investment. And maybe you're one of the anomalies out there that has had a tankless system for some time now, and you're starting to experience a few problems. If this is you, we can help you out big time with affordable tankless water heater repair. Since they are relatively new to the scene, chances are you've got a conventional storage tank unit instead, and you're considering upgrading to the future of hot water facilitation. A new, tankless water heater installation can provide you with hot water on demand that doesn't run out when your family members all need to shower after a day at the beach. Sure it will cost you a bit to have it done now, but you'll make that money back and then some as time progresses. Another factor to note is that updates to local building codes can make replacement of a conventional unit more complex than simply hauling the old one out, and putting the new one in it's place. Things like the mount, the size or type of venting system, the drain pan underneath, and supply pipes are all elements that may require upgrade as well to satisfy today's local building code requirements. Remember, we do both residential and commercial water heater repair and installation. So, if you've got a local business that is in need of pumping out some serious warm water, we can make that happen. We will always provide you with what we believe to be the best option for you and your situation, regardless of what it puts in our pocket. Just contact us and we'd be happy to address your inquiries and concerns. Our aim is to treat you fairly--just as we would our own family. A good reputation is what separates us from the rest of the water heater companies out there, and we want to give you nothing but the best in quality customer service. If you've got absolutely zero hot water, it could be due to the unit not getting power, a tripped limit switch, or failure of one or both of the heating elements. First, we check the unit's circuit breaker in the service panel to make sure it isn't tripped. If it is, we'll simply switch it off and then right back on. This might be the only issue, and if so-- it's a cheap fix! If that doesn't resolve the issue, we have to dig deeper. The next step is to remove the access panel for the upper element. We'll remove the insulation, and then the plastic safety guard-- being extra careful not to touch any wires or electrical terminals. The high-temperature cutoff reset button—located above the upper thermostat, is the next point of interest. We'll push that button, replace the safety guard, insulation, and access panel, then turn the circuit breaker back on. If the problem remains, one or both of the heating elements are the likely culprit. "I've got hot water, but it runs out too fast!" The demand you require could be in excess of the unit's capabilities. On average, about 75 percent of its capacity should be seen in hot water. For example, a 50-gallon unit should produce around 37.5 gallons of hot water on demand. If the demand is too great, you'll have to try to limit shower length accordingly. Other options include using a low-flow shower head, and spacing out the times that you shower, do laundry, and use the dishwasher. If your unit suddenly produces less hot water than before, there's a good chance that one or both of the heating elements have failed. If during a shower you have a constant supply of lukewarm water, a defective upper heating element is likely the reason why. A defective lower heating element will make for a shower where the hot water runs out very quickly. "The water is way too hot and scalding me!" Too much hot water can be a problem of it's own. If this is the case, it could be that one or both of the thermostats are set too high. The recommended setting is between 115 and 125 degrees Fahrenheit. While it may be a simple adjustment to make, the diagnosing of the problem is what you call an expert in for. "Water is leaking everywhere, help!" Normally, leaking is due to faulty plumbing connections or valves, but it could also be a result of a problem with the tank itself. Sufficient damage to your home could happen because of a leak-- especially if you aren't home to catch it. It's important to fix the leak as soon as possible. Loose heating elements or tank corrosion can cause leaks. We'll inspect the elements for looseness, and tighten them up if necessary. If your tank is corroded, it can't be repaired and must be replaced. To put stop to the leaking while you wait for us to arrive, shut off the power and water supply, and drain the tank completely. But we're usually pretty quick to get there when you've got an issue like this. "​The water coming out of my faucet is rusty looking or smells bad!" If you've got water with a brown, yellow, or red tint to it, there's a good chance that corrosion is occurring either inside your tank, or in the pipes in your home. If it's got a funky smell to it like rotten eggs, there may be bacteria in the tank. The anode rod may need replacing. "My water heater is making weird noises!" Do you hear a low rumbling or popping noise coming from your unit? perhaps a high pitched screech? it could be the sound of boiling water. Remember that sediment accumulates over time in the bottom of the tank. This could cause it to overheat, and boil the water. First thing we'll do is drain the tank in an attempt to remove the sediment. If that doesn't fix the issue, you may need to replace the water heater with a new one.